Scientists have determined the properties of unseen "tails" sticking out of supermassive black holes at the heart of active galactic nuclei by analyzing unexpected discrepancies between the data of high-precision observations conducted by an international network of radio telescopes and that of Gaia -- a space observatory of the European Space Agency carrying optical telescopes on board. "It is no exaggeration to say that a new area of observational astrophysics has begun," says Yuri Kovalev who heads MIPT's Laboratory of Relativistic Astrophysics and a laboratory at the Lebedev Physical Institute (LPI) of the Russian Academy of Sciences. "By comparing the data from radio interferometers and optical telescopes, we can obtain information about hot jets and the accretion disks surrounding black holes at the center of galaxies in the visible part of the spectrum. We have now gained a better understanding of what their structure is and what processes occur inside them." Yuri Kovalev and Leonid Petrov from MIPT and LPI collaborated on a research paper, which has recently been published in Monthly Notices of the Royal Astronomical Society, that analyzes the coordinates of active nuclei of remote galaxies obtained independently by very long baseline interferometry, or VLBI, and the Gaia space astrometry observatory. In 2013, the European space observatory Gaia was launched with an aim of cataloging the precise coordinates and velocities of 1 billion stars in our Galaxy. Hipparcos, its predecessor, gathered data on the positions of some 1 million stars with a maximum precision of 1 millisecond of arc. In the near future, the accuracy of Gaia will reach 24 microseconds of arc. In addition to stars in our own Galaxy, this telescope can observe objects outside the Milky Way. By now, Gaia has cataloged more than 1 billion objects. More than 10,000 of these are extremely bright active galactic nuclei called quasars. These involve matter in the form of what is known as an accretion disk falling onto a supermassive black hole that, in turn, ejects extended beams of matter called jets. As matter falls onto the black hole, it is heated to temperatures so extreme that it starts emitting radiation across almost the entire electromagnetic spectrum. To study such objects, VLBI has normally been employed. It involves the use of multiple radio telescopes positioned far from each other but working as an integrated system. This technique allows to best the angular resolution achieved by optical telescopes several hundredfold. 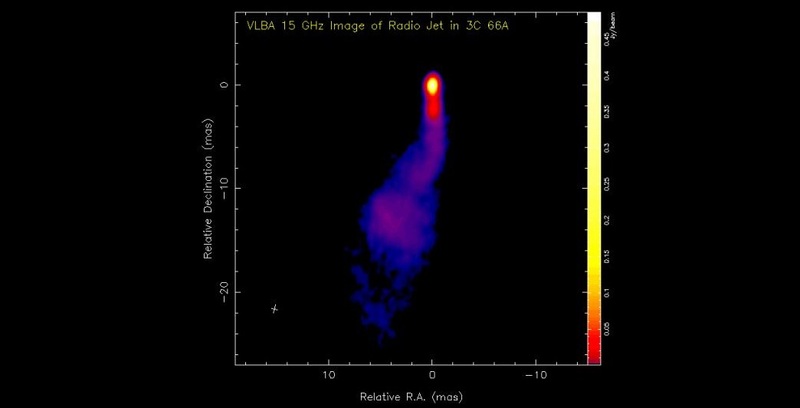 This is what made radio signals so useful for resolving the structure of jets expelled by quasars. "But there are things you can't see in the radio," says Leonid Petrov. "Thus, for instance, an accretion disk around a supermassive black hole emits mostly visible and ultraviolet light. So we decided to combine the data from two sources." In contrast to the Hubble Space Telescope or similar instruments, Gaia does not, by itself, produce an image. Instead, it registers the coordinates of the center of the luminosity of a celestial object. Together with MIPT student Alexander Plavin, Kovalev and Petrov compared the data on the coordinates of quasars obtained by Gaia and VLBI. It turned out that, for roughly 6 percent of objects, the positions did not agree very well. Generally, the position of an object provided by Gaia was shifted in the direction of jets. "We can now use the data on variable radiation output and position of quasars provided by radio interferometry and Gaia to recreate and study the structure of hundreds of very remote quasars at the scale of parsecs, thousandths of a second of arc. This precision is superior to what is possible with ordinary optical telescopes and even with Hubble," says Kovalev. He adds that data analysis revealed the existence of bright jets emitting in visible light in many quasars at angular scales so fine that even the Hubble Space Telescope cannot detect them. In order to see such a structure directly, a space telescope with a mirror the size of a stadium would be needed. The scientists suggested a method for revealing this structure indirectly by means of combining the data from existing telescopes. The investigation of variations in source positions and brightness will help us find out what causes bright flares in active galactic nuclei. This will improve our understanding of the physics of accretion disks and supermassive black holes. There is even a further practical aspect to this discovery: VLBI-based quasar observations are used in navigation to establish a celestial frame of reference. This is necessary for tracking the movement of continents and operating positioning systems, including GPS and GLONASS. The comparison of the data provided by VLBI and the Gaia space telescope indicates the presence of a certain source position "jitter" in the optical range. As a consequence, caution is required when using the coordinates of active galactic nuclei obtained by optical observations for navigation.